Paweł Bogdan Adamowicz ([ˈpavɛw ˈbɔɡdan adaˈmɔvʲit͡ʂ], 2 November 1965 – 14 January 2019) was a Polish politician and lawyer who served as Mayor of the city of Gdańsk, Pomeranian Voivodeship, from 1998 until his assassination in 2019. Adamowicz was one of the organizers of the 1988 Polish strikes before becoming the head of the strike committee. In 1990, he was elected to the Gdańsk City Council, chairing the body from 1994 during his second term and holding this post until 1998. He was elected Mayor of Gdańsk in 1998 and reelected in 2002 with 72% of the vote. In 2018, he was reelected as an Independent. He was known as a liberal, progressive figure, speaking in support of LGBT rights, immigration, and minority groups such as Kashubians. On 13 January 2019, Adamowicz was stabbed during a live charity event in Gdańsk by a former inmate, who had been released from prison a month prior to the assassination. Adamowicz died the following day from his injuries, at the age of 53. Adamowicz was born in Gdańsk. His parents Ryszard and Teresa were Polish economists, who were resettled to Poland from Vilnius, Soviet Lithuania, in 1946. Paweł later recalled that his parents were suspicious of the communist system and party propaganda. "Like many Poles of our generation, [my] brother and I have thus been shaped against the obligatory official history; since childhood we have known not only the sinister wording of the Gestapo abbreviation, but also the NKVD; we perfectly understood what is behind the names of distant places: Kazakhstan, Siberia, Katyn. We hardly saw a place for ourselves in this double world." He studied law at the University of Gdańsk, where he also rose to prominence as a student movement member. He was one of the organizers of the 1988 strike, becoming the head of the strike committee. Between 1990 and 1993, he served as a vice-rector for student affairs at his alma mater. In 1990, Adamowicz was elected a member of the city council in Gdańsk, chairing the council from 1994 in his second term, and holding this post until 1998, when he was elected the Mayor of Gdańsk. On 10 November 2002 he was re-elected with 72% of the vote. He was awarded the Pro Ecclesia et Pontifice Golden Cross by Pope John Paul II, and the Cross of Merit in 2003 by President Aleksander Kwaśniewski. In 2014 he received the Cross of Freedom and Solidarity in honour of his contributions on behalf of Polish democracy. In 2018 he was an honorary patron of the 4th Gdańsk Gay Pride Parade, in which he also participated. In November 2018, Adamowicz ran as an independent for the office of Mayor of Gdańsk and was re-elected for a sixth term, being endorsed by the Civic Platform and remaining a vocal critic of the current ruling party in Poland, Law and Justice. He was due to serve until 2023. In 1999, Adamowicz married Magdalena Abramska, a law student at Gdańsk University whom he met during his studies. She later became a professor of law at the University. They have two daughters, Antonina (born 2003) and Teresa (born 2010). On 13 January 2019, Adamowicz was stabbed in the heart and through the diaphragm with a knife on stage at the Great Orchestra of Christmas Charity event in Gdańsk and was taken to University Clinical Centre in Gdańsk in critical condition, where he underwent five hours of surgery. He succumbed to his injuries the following day. The assassin was apprehended at the scene of the crime. A Gdańsk police spokesman said the detained man was a 27-year-old who lived in the city, named as Stefan W. by the Gdańsk prosecutor's office; the spokesman also stated that the man had a "long criminal history", including four bank robberies and an attack on a police officer. After stabbing the mayor, he seized the microphone and claimed false imprisonment and torture at the hands of the previous centrist Civic Platform (PO) government. Adamowicz's murder was inadvertently captured on video by the many attendees of the charity event. On 14 January, thousands attended vigils across Poland to pay their respects to Adamowicz. His widow, Magdalena, who was in London at the time of the assassination, was flown back to Poland by the Polish government. President Andrzej Duda described the attack as a "hard to imagine evil" and stated that the day of Adamowicz's funeral will be observed as a national day of mourning. Interior Minister Joachim Brudziński described the attack as "an act of inexplicable barbarism" and, on Twitter, EU Council President Donald Tusk said, "Paweł Adamowicz, Mayor of Gdańsk, a man of Solidarity and freedom, a European, my good friend, has been murdered. May he rest in peace." Jean-Claude Juncker, the President of the European Commission, expressed "great sadness" and offered his "deepest condolences" on behalf of the European Commission. The European Parliament held a minute of silence to honour Adamowicz, with President Antonio Tajani speaking of the mayor's "closeness to the people" and "ability to listen". Sadiq Khan, the Mayor of London, described the attack as "Devastating violence ... for all of us who value public service and open, accessible democracy". Anton Alikhanov, the governor of the neighbouring Kaliningrad Oblast in Russia, expressed his condolences, calling Adamowicz "our great friend" and proclaiming a minute of silence in memory of his passing. On the day of his funeral, Pope Francis offered his condolences as well as gifts for the family of Adamowicz. 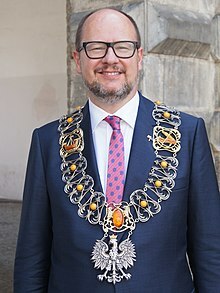 The mayor of Bremen Carsten Sieling, which Gdańsk is a twin city with, said "we are shocked by the terrifying and cruel death of Paweł Adamowicz". In the city hall a book of condolence was displayed from January 14th through the 17th. On 18 January 2019, Adamowicz's coffin was decorated with white flowers and draped with the flag of Gdańsk, before being driven in a hearse from the European Solidarity Centre in the city, past schools, monuments and other places significant to the dead mayor's life. It was watched by thousands of people on screen. When the hearse reached the Church of St Mary, the city's main basilica, the coffin was brought into the church. After a mass, Adamowicz was cremated. On 19 January, the main funeral service was held at St Mary's Church, Gdańsk. Notable people who attended included the President of the European Council Donald Tusk, President of Poland Andrzej Duda, Prime Minister of Poland Mateusz Morawiecki, former Presidents of Poland Lech Wałęsa, Aleksander Kwaśniewski and Bronisław Komorowski, and former German President Joachim Gauck. Thousands more Poles watched the service on screens. At the end of the service, Adamowicz's ashes were laid to rest in one of the chapels of St Mary's Church in Gdansk. ^ "Liberal mayor of Poland's Gdansk dies after stabbing". Reuters. 14 January 2019. Retrieved 17 January 2019. ^ a b c "ULI Belgium Annual Conference" (PDF). Urban Land Institute. 16 May 2017. Archived (PDF) from the original on 14 January 2019. Retrieved 14 January 2019. ^ a b "Padły bastiony Sojuszu" (fee required). Gazeta Wyborcza. 12 November 2002. Archived from the original on 29 February 2012. Retrieved 5 November 2009. ^ a b c d "Who was Pawel Adamowicz?". 14 January 2019. Retrieved 14 January 2019. ^ "Gdansk mayor Pawel Adamowicz dies after being stabbed in heart on stage". ^ a b Wiktor Ferfecki (14 January 2019). "Prezydent Gdańska Paweł Adamowicz nie żyje". Rzeczpospolita. Retrieved 14 January 2019. ^ Friszke, Andrzej (2006). Solidarność podziemna 1981-1989. Instytut Studiów Politycznych Polskiej Akademii Nauk. p. 261. ISBN 978-83-88490-45-3. ^ "Paweł Adamowicz życiorys dzieci rodzina – prezydent kadencja". Paweł Adamowicz (in Polish). Archived from the original on 1 September 2018. Retrieved 14 January 2019. ^ a b c "Gdańsk – the official site of the city". 5 December 2018. Archived from the original on 5 December 2018. Retrieved 14 January 2019. ^ a b "Notable Deaths – The mayor of Gdansk, Poland, has been assassinated at a charity event". Legacy.com. 14 January 2019. ^ "26 maja ulicami Gdańska przejdzie Marsz Równości". Archived from the original on 17 November 2018. Retrieved 17 November 2018. ^ "A 'friend of Jews,' Polish mayor dies after stabbing attack - Diaspora - Jerusalem Post". www.jpost.com. Retrieved 15 January 2019. ^ "Wyborcza.pl". trojmiasto.wyborcza.pl. Retrieved 13 January 2019. ^ Plucinska, Joanna (14 January 2019). "Mayor of Gdansk dies after stabbing – doctor's statement". Reuters. Retrieved 14 January 2019. ^ Davies, Christian (14 January 2019). "Mayor of Polish city dies after stabbing at charity event". The Guardian. ^ Pietrzak, Karolina. "Stefan W. usłyszał zarzuty. Nożownik odpowie za zabójstwo Pawła Adamowicza". wiadomosci (in Polish). Retrieved 14 January 2019. ^ a b "Stabbed Polish mayor dies in hospital". 14 January 2019. Archived from the original on 14 January 2019. Retrieved 14 January 2019. ^ GERA, VANESSA. "Doctors fight to save Polish mayor stabbed in heart on stage". idahostatesman. ^ "Polish mayor dies after being stabbed at charity event". RTÉ. 14 January 2019. Retrieved 14 January 2019. ^ Davies, Christian (14 January 2019). "Mayor of Polish city dies after stabbing at charity event". The Guardian. ISSN 0261-3077. Retrieved 14 January 2019. ^ Gazeta.pl (14 January 2019). "Atak nożownika w Gdańsku". YouTube. Retrieved 14 January 2019. ^ ""Największe serce świata"– w hołdzie dla Pawła Adamowicza zapłonęły znicze". radiopik.pl. Radio PiK. Retrieved 17 January 2019. ^ "Thousands march across Poland to remember slain mayor". Retrieved 15 January 2019. ^ "Deadly attack on Gdansk mayor sparks protests in Poland". Retrieved 15 January 2019. ^ "Reactions to the death of Gdańsk Mayor". Retrieved 15 January 2019. ^ Kaлининград.Ru. "В правительстве области почтили минутой молчания память президента Гданьска". kgd.ru (in Russian). Retrieved 15 January 2019. ^ Костоглодов, Денис. ""Наш большой друг": чем запомнился Павел Адамович жителям Калининградской области". kgd.ru (in Russian). Retrieved 15 January 2019. ^ "Papież Franciszek złożył kondolencje rodzinie Pawła Adamowicza". Retrieved 19 January 2019. ^ a b c "Pawel Adamowicz: Poland mourns death of stabbed Gdansk mayor". BBC News. 19 January 2019. Retrieved 19 January 2019. ^ "Paweł Adamowicz nie żyje. Zachodni politycy oddają mu cześć. "Druzgocąca strata"" [Paweł Adamowicz is dead. Western politicians worship him. "Devastating loss"]. Gazeta (in Polish). 14 January 2019. Retrieved 24 February 2019. ^ a b "Paweł Adamowicz: thousands attend Gdańsk mayor's funeral". The Guardian. 19 January 2019. Retrieved 19 January 2019. ^ "M.P. 2010 nr 98 poz. 1144". Retrieved 2 November 2018. ^ "Paweł Adamowicz Kawalerem Orderu Legii Honorowej". Archived from the original on 25 June 2018. Retrieved 2 November 2018. ^ "Teenetemärkide kavalerid". Archived from the original on 25 June 2018. Retrieved 2 November 2018. ^ "Paweł Adamowicz honorowym obywatelem Warszawy". Retrieved 17 January 2019.